I was inspired to order this product after seeing a few of my fellow Walmart Moms trying it out on SAMY's Facebook page. I had been pregnant for what seemed like forever, and now I was anxious to get rid of the grays that had accumulated over 10 months. I placed my order from Walmart.com, and got it within a few days. What is my final verdict on Samy Fat Foam Permanent Hair Color ? I love it. While it could stand a few improvements (the product packaging seemed a bit wasteful and the foam was runnier than I had hoped), it left my hair soft, with vibrant color and hardly any of the yucky smell that other colors leave in for a few days. I would highly recommend that if applying the shampoo and conditioner in the shower, you cut open the packages with scissors before getting in (the little package are terribly difficult to open). You will also want to order a shade lighter than you are used to ordering... the color runs a bit dark. 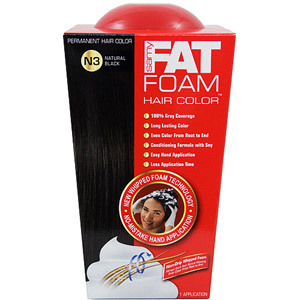 Fat Foam can be ordered from the Walmart website or at your local Walmart retailer. Have you tried Fat Foam? What are your thoughts? *This was an uncompensated review in which I purchased product myself. All opinions are my own. I tried this product this weekend and really loved it. The only part that came out dry were my ends, but they are in desparate need of being cut anyway. It was so easy to apply compared to regular dye products that I use. Love the foam!! Also found out that the Wal-mart website does not carry it anymore. Sure hope the stores continue to stock it. I tried this product and it was easy to apply --- but really not any easier than the typical hair color. The color grabbed much darker on some of my hair and my hair is VERY dry. I hope that with a few shampoos the color will even out and some deep conditioning will help. I will NEVER use this color again. This is a HORRIBLE Product!! I HAD colored light reddish blonde hair and I used medium blonde based on the color on the box. Not one strand on my head is the color that is on the box!! If it had come out the color on the box which I believe I should expect to have. I have MEDIUM BROWN HAIR which is absolutely HORRIBLE!!! I will tell everyone I know NOT to ever use this product or any of your company products! I called Customer Service and they said I can't color my hair for 2 or 3 weeks which is absolutely NOT acceptable!!!! DON'T BUY THIS PRODUCT!!!!!!! !